Where do I even begin with this book? I spent last night clinging to the last pages because I didn’t want it to end and when I did I had a real ache – a severe book hangover. 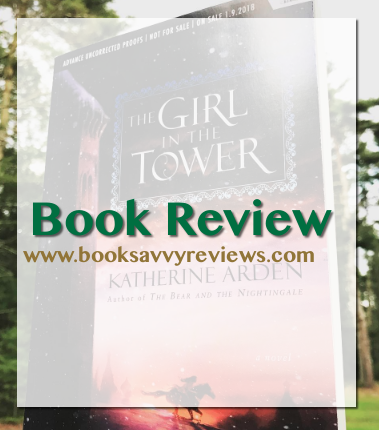 That is what I love about Katherine Arden, not only did she deliver a grand debut novel, but this sequel was just as good if not better than her debut. I finished this book with my heart in my hand and a wonderful ache for more of this world. In this installment Vasya is on a mission to explore the world, she doesn’t want to be bound simply because she is a female in these harsh times so she sets out dressed as a boy in fine clothing and along the way, trouble finds her – as it always does. Soon, she is tasked with the mission to save the Grand Prince and those dear to the family, but can she keep her identity as a girl a secret? Or will it tumble out and endanger those she loves? Honestly, there was not a bad line in the book. I marked so many passages down because I couldn’t decide which to choose. Morozko, the frost demon, and Winter-King is back, his presence is stronger in the book, his story more extensive but still enough to keep a reader wanting more. I fell in love with him in the prior book and for those who are wondering — if you loved him then you will love him more now. He is such a strong character but has vulnerabilities even as an immortal. Vasya has grown by leaps and bounds and she even continues to do so, sometimes her headstrong behavior can come across as irritating because she wants to do it all and prove herself – which allows her character to develop and grow so it adds real depth to her. It shows how strong womankind was in these times, silenced they might have been and tossed aside to be shoved in towers or rooms, they were still strong individuals. Let’s not forget beyond character growth and development, Arden created this world that is not only rich in culture but as a reader, I could nearly taste the air and feel the elements as I was plunged into the world. Vivid and riveting, I was captivated by the first page. It is something Brian Froud & Jim Henson would have had a field day with. The eeriness, the dark fantasy that is presented in stunning prose. I absolutely cherish Arden’s storytelling capabilities. I highly recommend this. Indulge in beautiful storytelling. I sincerely wish I could give more than 5 stars.